Agriculture is challenged by balancing increasing food production while maintaining the environment and all it provides. Nutrient use is a critical aspect of ensuring sustainable production systems, by balancing the removal of nutrients in produce with inputs of nutrients from mineral fertilizers, organic sources and natural processes. This is a considerable challenge to all who research, develop, advise on or manage production systems. Getting nutrients "right' ensures that other resources - water, genetics, energy, soil, capital, etc - are not constrained by a lack of nutrients, and that the nutrients applied or accessed are used effeicienct. Both efficiency - such as measured with a partial nutrient balance, and effectiveness - such as measured by a partial factor productivity - need to be considered when discussing the nutrient balances of food production systems. 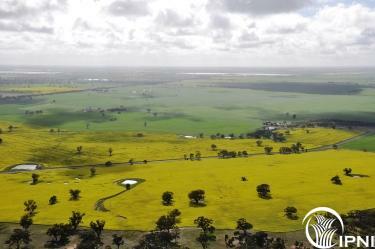 The image below - identifies to me the issues of sustainability - the picture is taken at Corack in the Wimmera/Mallee and shows a fantastic canola crop that has benefited from good management and will give the producer a nice return. Within the middle of this paddock is a small lake that filled with good spring/summer rains and is a habitat for bird life highlighting the environmental connection to production systems. This wetlands also has a social dimension as it provides a cool place for animals - including us - during summer. The link between production system and environment goes further though, because the efficient production system of the landholder means that the central part of this paddock did not get cleared so ensures this social benefit for future generations as well as the environmental benefit for all. 4R Nutrient Stewardship is central to this production system meeting its sustainability goals - getting the rght source applied at the right rate and at the right time and in the right place has meant the crop, envrironment and society all benefit. These concepts and issues were discussed at the Crop Science Society of South Australia February 2013 meeting. A copy of the slides in the presentation can be downloaded below.